There are only three ways to transit between the Pacific and Indian Ocean. First, one can drop down to the roaring fourties (40-50S latitude) and make your way around the south end of Australia. The other is to transit the Torres Straits between Australia and Indonesia – notorious for swift currents, typhoons/cyclones and difficult navigations through reef strewn shallow waters. The last and most used route is that through the Straits of Malacca i.e. between Indonesia and Malaysia – notorious for variable or non-existent winds, pirates, currents and hot spices. In the last 10 years the one factor that has influenced the movement of long distance ocean cruisers is that the passage through the Red Sea is no longer a given. Pirates infest the waters and cruisers have been kidnapped, killed and maimed while trying to enter/exit the Red Sea. This has forced them to either wait in SE Asia for conditions to improve i.e. for piracy to abate, or choose to go south around the Cape of Good Hope. Not everyone wants to make their way around the cape as it has a notorious reputation for dangerous seas that has provided nightmares for sailors for centuries. Hence, south-east Asia is a bottle neck for cruisers from around the world. 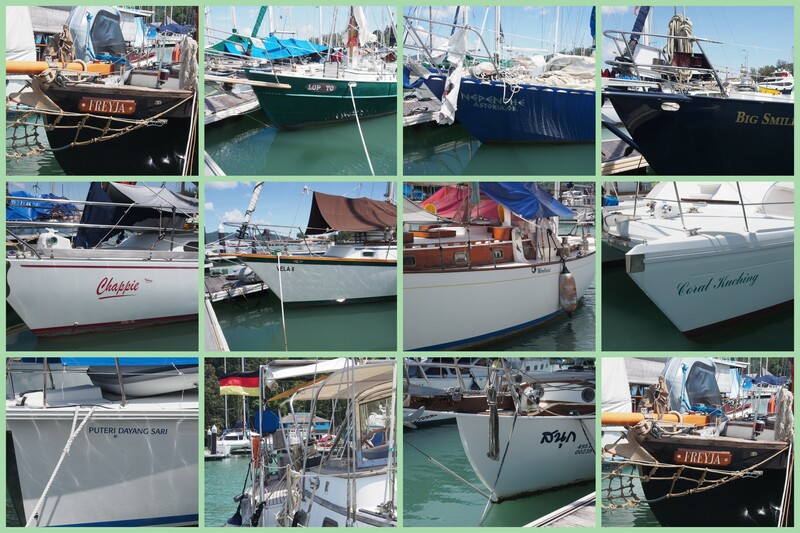 There are boats here registered in almost every major port of the world as well as the smattering of boats from the U.S. that can be registered in places like Reno, Nevada. There’s a cornucopia of people onboard. Here at the docks at the Royal Langkawi Yacht Club on our pier there are people from the Solomon Islands, Canada, Germany, Australia, New Zealand, England, South Africa, United States and the list goes on. What brings people here? People come here for the obvious reason that if you are sailing around the world you can’t avoid it. The Malacca Straits acts as one of the main funnels between the Indian and the Pacific Ocean hence Singapore has grown into an immense city-state with man-made as well as natural islands filled with industry and surrounded by hundreds of tankers either at anchor or on the move between the Pacific and Indian Oceans. Singapore is not the choice for sailing vessels transiting the world as a place to stop for very long. It’s crowded, expensive and has limited dock space. However, head up the Malacca Straits to Phuket and Langkawi and one enters a dreamland for long distance sailors. The islands entice sailors with good anchorages, hidden but accessible hongs, sandy beaches, exotically spiced foods,, affordable and most important of all there are no typhoons or cyclones at any time of the year. 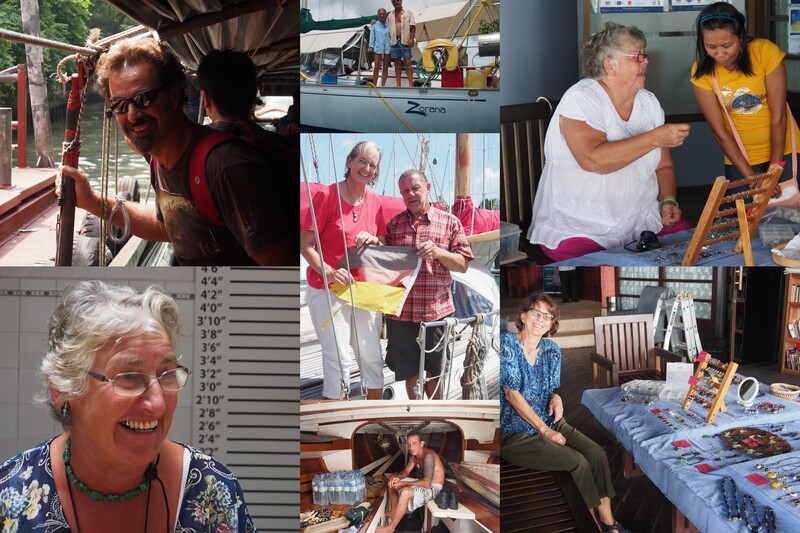 Unlike a lot of other cruising areas of the world there are a whole variety of reasons why so many sailors are here. First there are those we refer to as the Charterers: people who come from around the world to charter a sail-boat to cruise through the islands around Phuket and north as well as the islands south to Langkawi. They are here for a short period of time be it three days or up to a month. They may or may not have chartered and/or sailed in other areas of the world. They are here with money in their pockets and are expecting to experience as much as they can in the short period of time they have set aside. 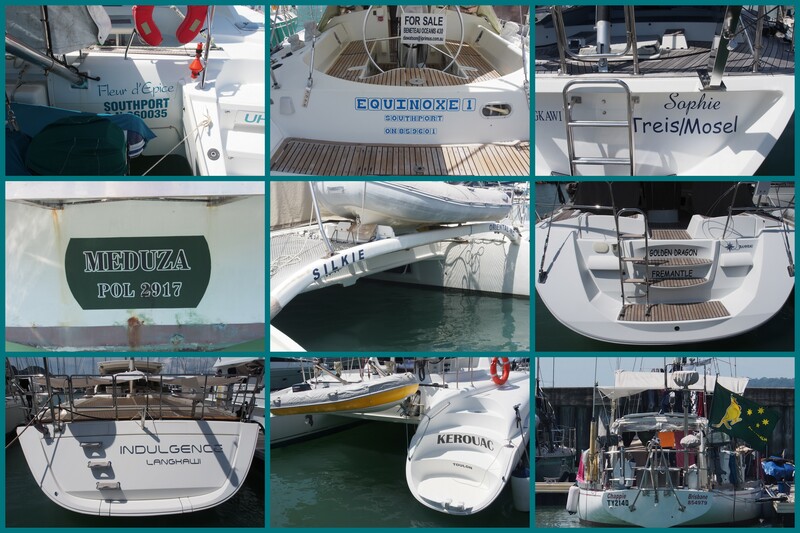 The charter trade here is predominantly populated by 12-20 metre catamarans that can accommodate a lot of people to share the costs. They can roar around from anchorage to anchorage either under sail or by using the two engines they are usually equipped with. The charterers are not interested in meeting other people on cruising boats. They have an agenda and they are here to accomplish what they have in mind. They set out for the trip with plenty of food, friends onboard, dive gear, a bar well stocked and a cruising guide to see them through the islands with all the anchorages marked and evaluated for their beauty and/or facilities. Secondly are the people who have left their boats here for the SW monsoon season and are just now, in November, coming back to claim their boats, get them ready for the season, repair any damage left undone when the boat was put away or occurred during the SW monsoon season. Lets call these the Part-timers (in Canada they may be known as snow-birds). They know the area well, they have been here before and they know what they want to do and see. Many of these are Australians as Air Asia runs cheap flights to almost anywhere in Australia from either Phuket and/or Kuala Lumpur. However, there are also others from may other parts of the world. Part-timers are only here for a short time. They are focused and still probably in ‘work mode’. That is, they haven’t slowed down, are efficient with their time and have a specific idea what they want to accomplish in 6 months. They are not so interested in connecting with the people living and cruising on their boats full-time from other countries but do partake in social gatherings of other yachties if they are around. Then there are the Full timers. They live, travel, work and reside on their boats 365 days of the year. They rarely travel ashore and are on the move depending on weather patterns. Some have been cruising for upwards of 35 years or more and others are just starting on their dreams of long distance voyaging. They sometimes travel alone or having found compatible cruising friends sail for a while together before eventually parting ways hoping to meet up in an anchorage in some far off spot in months or years. The Full timers are usually very social. The boat may be their life savings and the only home they know but for the most part they are debt free and able to wander the earth’s oceans content to know they don’t have a payment to make next month. They may not have a lot of money but they can keep going and are not beholden to monthly payments for communications, cars, mortgages etc. They sometimes stop for work if the purse is empty or they may be fortunate enough to be economically self-sufficient. They see no end to their movement and have no thoughts of returning permanently to land. Being at the choke point they may be seeing other full timers they haven’t seen in years but they are also ready to make friends with sailors who may have just joined one of the groups above. This is their community. This Choke Point has created a local sub-culture of boaters the local community must have a hard time understanding but for someone caught up in this whirlpool it presents interesting opportunities and endless fodder for discussions and laughter. In the end we have come together through good fortune, hard work and a passion for travel and the sea. No matter if we are a charterer, a part timer or a full timer I just hope the sea is kind. I hope none of us have to experience the traumas of a typhoon such as what has just happened to sailing friends and local communities in the Philippines with Typhoon Haiyan. great read, Tony. help me w/this one pls: “hidden but accessible hongs”. Tony, did you write this? Is SAGE one of the boats? Talk to you tonight at Gail’s! Sounds like my life on land in Mexico…and truthfully aren’t you a little, if only a little disdainful of those that aren’t full timers. Here in San pancho the charterers are referred to as bolillos (squishy soft white buns) or carne fresco.